America's Miss World is the official United States preliminary to Miss World. The owners of America's Miss World received the license from Miss World after the Miss World organization canceled their contract with Miss World America, the previous United States preliminary to Miss World. The winner of America's Miss World will advance to the Miss World finals and will compete in the month-long competition for the crown of Miss World. America's Miss World is held in Orlando, F.L. Contestants for America's Miss World are appointed through an application process. Qualified candidates are accepted after undergoing an interview to discuss Beauty with a Purpose, academic or career achievements, and personality. Contestants submit a 2-3 minute Beauty with a Purpose video detailing their philanthropic efforts. During the week of the National Final, contestants compete in a sports challenge designed by professional athletes. Contestants also undergo a series of judges interviews. For onstage competition, contestants compete in a preliminary event to model fitness wear (points go towards their overall Sports & Fitness score) and model evening gowns (points go towards their Top Mode score). At the final event, the top candidates are announced and re-compete in fitness wear and evening gown and compete in onstage question. The candidate with the most accumulative points at the end of the final competition will be crowned America's Miss World and will represent the United States of America at the Miss World pageant. Miss World is the oldest and largest international beauty pageant in the world. Miss World is held annually with representatives from over 120 countries worldwide. The winner of Miss World is determined by accumulative scores of “fast track events”.. These fast track events include: Sports, Top Model, Talent, Multimedia, Interview, and Beauty with a Purpose. The 2017 Miss World pageant will be held in China. The Miss World pageant is one the most publicized beauty pageants in the world, watched by over 1 billion people worldwide and televised on E! Entertainment in the United States. The newly crowned Miss World fulfills her reign by traveling worldwide as an ambassador for culture and Beauty with a Purpose. Miss World works closely with "Beauty with a Purpose". Established in 1972 by Julia Morley, Beauty with a Purpose works closely with many charitable organizations, primarily to give back to children around the world. Beauty with a Purpose was created by Julia Morley in 1972. The Beauty with a Purpose initiative is at the heart of Miss World with the organization working tirelessly to raise funds for many good causes over the years. More than $1 billion USD has been donated to local and international organizations in aid of disadvantaged children around the globe. Variety, The Children’s Charity, has been closely associated with Miss World for many years. Upon her inauguration as International President of Variety at the Guildhall in London, Julia Morley was joined by ten previous Miss World winners in support of her appointment. The Beauty with a Purpose Award is presented at the final pageant each year, after contestants present their community service and charitable projects. The contestant with the best project receives the award, which adds many points to their final score, as well as $10,000 to go to the charity the award winner has been working with and a visit from the newly crowned Miss World to the Beauty with a Purpose winner's country to aid in her philanthropic efforts. Each year, over 120 national titleholders compete for the title of Miss World in six challenge events, as well and interviews. 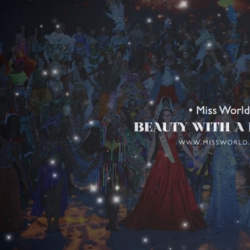 Miss World contestants participate in Beauty with a Purpose, Multi-Media, Sports, Interview, an optional Talent competition, and Top Model, leading up to the final competition. At the Miss World final competition, contestants are narrowed down through a series of questions and interviews. There is also a category for People’s Choice at Miss World, with the contestant winning the people’s choice vote moving in the final line up.